In this article Adsy team is looking into the tendencies in content marketing for 2019. We’ve analyzed several b2b and b2c marketing surveys to determine three main trends to watch and employ. These are the emerging trends in marketing that have a power to drive loyal customers to your business. Implement them to ensure the prosperity of your brand this year. Transparency is the pillar of healthy and trusting relations between your business and its customers. 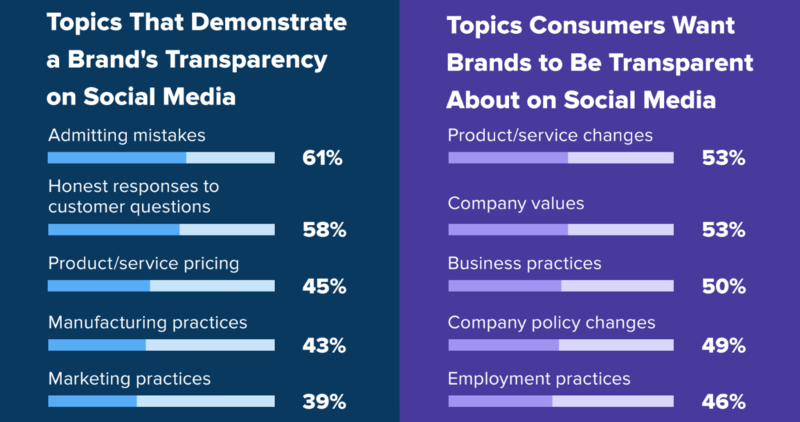 According to Sprout Social, a social media analysis tool, 86% of respondents more than ever before expect brands to be open and transparent. This is exactly the reason why it opens our Top 3 of marketing trends for 2019. This removes all the questions about how you should communicate with your readers, what experiences to suggest to them, and it also resolves many issues on brand voice choice. It’s clear that to win your users and increase sales you no longer need to seek some generic solutions. Work on opening up, and you’re on the way to success. With this seemingly easy key to fruitful relations between brands and customers, few brands are following the path at the moment. Only 15% of Americans believe that brands do open up to public, and 30% don’t see any signs of transparency for brands’ part. “Customers want more transparency, so what?” you may say. "It doesn’t mean that it will make them buy more.” It does, actually. Another study we’ve looked into, by Label Insight, revealed that 73% of consumer are even ready to pay more for your product if it offers frankness and clarity. These results can ONLY be achieved if you are open and transparent, admit your faults, and work on eliminating them. How do you reach transparency? Consumers don’t hide the fact that they want to gain access to almost all information the brand has to offer. Your company values and business practices, changes to the product or pricing, even financial performance make a difference and shift the audience’s perception of your brand. To help you get closer to your customers we’ve devised a few communication and content marketing techniques. First and foremost, choose the most effective medium to reach your audience with the best possible results. Customers themselves want the brand’s website to provide all the information on product attributes, as 50% of respondents confirm. At the same time, Sprout Social insists that transparency across social media is getting more weight with customers, especially, the most active age group -- millennials. 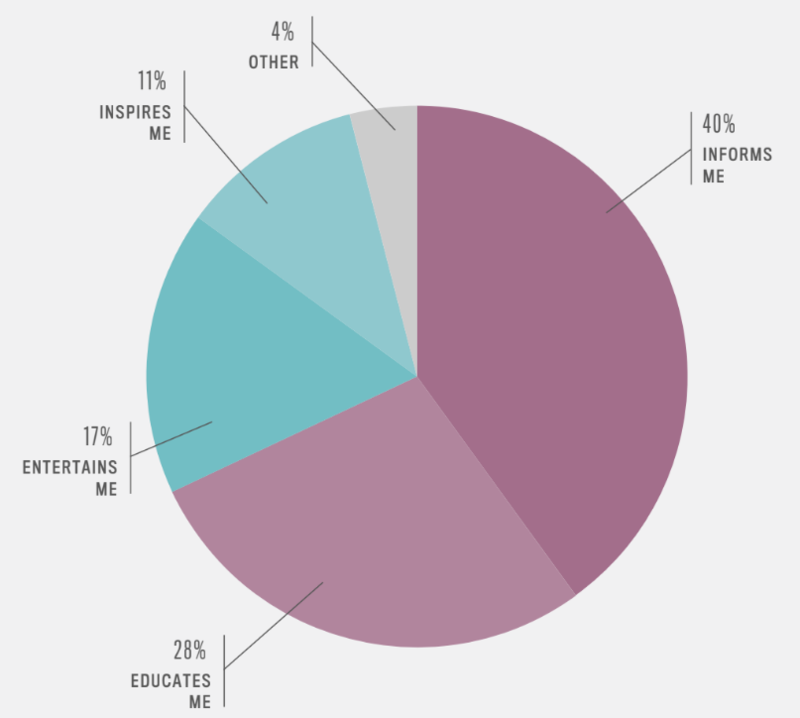 81% of young people consider social media the most accountable source of information. So after you've chosen the most important channel your next step would be to develop a reaction strategy -- forget about ignoring your customers’ opinions, questions, and worries. The majority of people lose faith in a brand when it leaves unanswered questions either from employees or from customers. So go get your SMM manager review all the messages on your brand’s page in social media. Silence is not golden in this case, and by letting comments and reviews go unnoticed you build a wall between your business and customers. Later you’ll be able to notice any tendencies in the questions your team gets. This is the perfect time to go further and try another content marketing format. Meet the queries upfront by creating content that will take the questions off before they are even asked. Tell more about your company values in social media posts, add the lacking information to your product descriptions on the site, show the backstage of your product creation, the people behind the services you provide. If you have some available resources it’s worth giving a shot at creating video content. Videos are rated the most trusted and transparent source of information (according to 67% of Americans), so leverage them if you can among other content marketing techniques you’re employing. You can read more about the positive impact of videos on your business in the blog post we published earlier. Personalization comes along with other current marketing trends, with 45% of users refusing to waste their time on content irrelevant to their needs. It becomes crucial for you to make sure you provide unique experience for your potential customers to make them listen and, eventually, buy from you. And if we fail to deliver content that corresponds our readers’ expectations, we may as well forget about getting likes, shares, and comments. And by expectations we not only mean the content itself, but posting time, targeting, and channels which altogether ensure truly personalized experience for your customers. The first thing to remember when creating content and personalizing it is the fact that three quarters of your potential buyers will perceive your brand relevant as long as your content is relevant. Even more, for 84% of people relevant content boosts their purchase intent bringing you closer to a successful sale. Once again we come to the understanding that channels we use for talking to our customers play significant role and may even determine the results we achieve. Interestingly enough, when asked where they discover content, millennials (aged 18-34) more frequently select Youtube (42% of respondents). Keep this in mind if your business mainly targets the young generation. For several years now users have been looking for content that would educate them, tell something new, answer the questions they have, and help solve the difficulties they face. In fact, few things have changed. 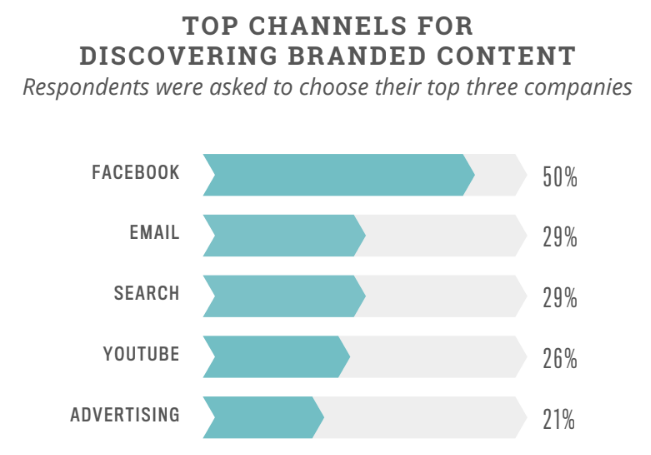 When asked what content marketing does for them, the majority names useful information -- 40% of users expect branded content to inform them, and 28% expect it will educate them. Surprisingly, only 17% of people want content to entertain them, which clarifies the type of content you should be focused on - helpful, insightful, and valuable to your users. Make these features your priority to grab your potential customers’ attention, and you’ll be able to stand out in the crowd of other brands in your industry. Other personalization examples you could add for your customers may include personalized product recommendations, online ads, or newsletter. Relevant discounts are a sure way to win your consumers’ trust, as for 63% of people a timely discount after their first encounter with the brand can be a loyalty driving factor. Even more, 54% of people expect you to offer them a discount within 24 hours after they’ve left their email on your site or have identified themselves in any other way. Don’t waste this opportunity and create a welcoming gift for newcomers. Influencer marketing is a known marketing method for almost anyone in the industry, and previously we posted some impressive case studies of its implementation. We believe that it will dominate the marketing world in 2019. So make it your ally in winning more customers and improving your business performance, as influencers’ power has not diminished an inch. Below we’ll describe the most trending ways of attracting influencers and look at the most effective strategies. How do your customers see influencers? CPC strategy published a report on the state of influencer marketing in 2018 in which they’ve identified the way consumers perceive influencers. For them, influencers are not some celebrities, but rather people with a big following base or anyone who promotes products on their social media. It is clear then that consumers have no illusions regarding the people giving advice about products and services - their popularity is supported by real numbers, not by some fleeting fame. At the same time, those people, influencers, come from the same world, live the same lives unlike celebrities, that’s why their opinion has good weight. Do they still trust them? Yes. Not unanimously, however. 44.2% of people will trust an influencer’s ad, if they already trust the influencer. 22.9% of people even say that such ad have the same weight as any other post by their favorite social media person. Okay, consumers do trust influencers. What about the relationship between marketers and the people they choose to partner with? Do they look in the same direction and know for sure what to expect from each other? Turns out, no. While 78% of marketers see influencers as a chance to drive brand awareness, only 37% of influencers understand this need. With 45% of marketers seeking to increase sales, just 22% of influencers know that they are expected to somehow make it happen. This poses a challenge for both parts, as marketers end up not reaching their initial goals, and influences get discouraged from the future partnership. To avoid this we recommend users looking for blog influencers at Adsy to shortly explain the main goal of collaboration. This way publishers are able to choose an appropriate voice for their audience. 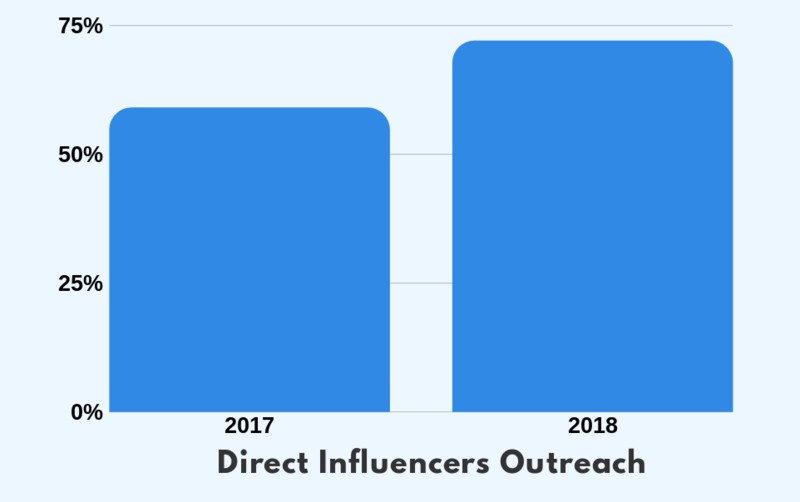 Direct outreach is the most popular method of reaching out to influencers, and it keeps gaining momentum. In 2017 59% of marketers used it, while in 2018 remarkable 72% preferred this method. Specialized influencer marketing platforms, however, receive more and more attention from marketers. 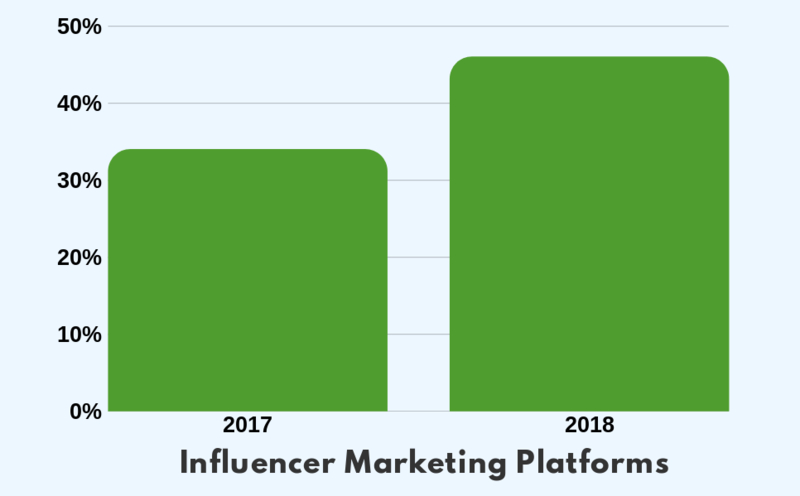 In 2018 46% used some kind of platform to find influencers for their brand, which is 12% more than the year before. At Adsy we’ve also felt this increase with marketers coming to promote their businesses through content marketing. When it comes to guest posts, the majority admits that soсial media influencers don't work that well, as business owners also expect to get Google approved backlinks to their sites among other benefits. With the help of guest posts they are able not only to increase brand awareness, but to improve rankings as well. Whichever influencer type you think is appropriate for you, make sure to leverage it. Be it a series of posts on Instagram or a dozen of guest posts from publishers in your niche, influencer marketing has a potential to help you reach your business goals. These were the three emerging trends in content marketing Adsy team looks forward to seeing brands use and develop. Are you working on any of them? Which other new marketing trends are you going to include in your strategy this year? Let's discuss them in the comments!